"Old pictures of terriers dating back 300 years illustrate cross-bred looking creatures, some of them bearing more or less the distinctive characteristic of the turnspit. Others indicate a considerable trace of hound blood, but not one, so far as the writer has come across, is hound marked, or bears any more white than is usually found on the chest or feet of any dog." Those words, from Rawdon Lee's Modern Dogs - The Terriers of 1896, may well surprise fanciers of West Highland White, Fox and Soft-coated Wheaten Terriers. White terriers feature prominently in our breed lists today. 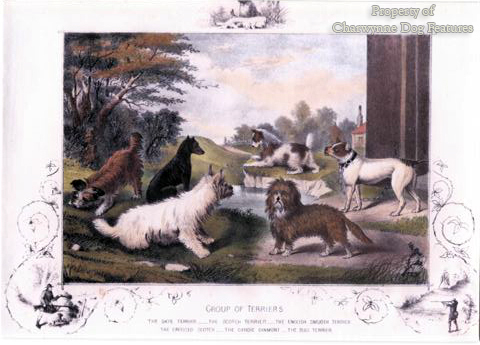 If you look at the Kennel Club's list of terrier breeds in 1908, you will notice that it contains just 16 breeds, unlike the 26 listed today. The 10 more recently listed embrace the Australian, Glen of Imaal, Lakeland, Norfolk, Norwich, Parson Russell, Cesky, Staffordshire Bull Terrier and no doubt will one day be joined by the German Hunt, Brazilian, Patterdale, Plummer and Lucas Terriers. We could so easily have had Cowley, Roseneath, Clydesdale, Paisley, Cheshire, Shropshire, Devon and Otter Terriers too; recognition of breeds of dog so often relies on determined individuals as much as ancient type. The terriers as a functional group are essentially British, with the distinguished breeds from Scotland, Ireland and Wales combining with those of England to give the canine world the much-loved terrier breeds valued everywhere. A long history is often claimed for breeds of terrier, but I doubt if terrier men in past centuries ever bothered much about pure breeding. In his The Book of all Terriers of 1971, John Marvin writes: "Despite claims made by writers who champion the antiquity of several of today's Terrier breeds, years of careful research have failed to disclose a single reference to any reproducible breed prior to 1800. In fact, the only deviations from the earliest descriptions are variations noted as to coat, size and legs." In his Field Sports of 1760, terriers are described by William Daniel as being of two sorts, one of them rough, short-legged, long backed and very strong, usually black or light tan colour, mixed with white. The other was said to be smooth-haired and more pleasingly formed, with a shorter body and a more athletic appearance, usually reddish-brown or black with tan legs. Prototypes of subsequent breeds are hinted at there. French and German writers of previous centuries have made reference to dogs functioning as terriers, not just Dachshund types but Pinschers and Schnauzers too. We may have captured the terrier breed market but not the terrier function. The Dobermann Pinscher and the Giant Schnauzer are, like the Airedale, not exactly earth-dogs but the smaller pinschers and schnauzers were farm and stable vermin controllers, just like our native terriers. The smooth-haired Austrian Pinscher has many similarities with our emergent Plummer Terriers. The Franks had a small dog they called the bibarhund or biberhunt, literally beaver-dog. From these came a type referred to as rattlers, both smooth and rough haired. Later came the Rattinpintscher, literally a dog that nips rats, and in time the breed-type we know as the pinscher and schnauzer, literally a dog with a bearded muzzle, developed. The German authority, Richard Strebel, writing in his massive work, Die Deutsche Hunde of 1903, recorded that: "There is little to say about the history of the German Pinscher. Illustrations of the breed are rare. It does not appear in old oil paintings. He occupied such a menial position, so unimportant, that artists felt it not worth their while to depict him for posterity." That statement echoes the omission of both pastoral dogs and terriers from English paintings of past centuries. In some old English dictionaries, the word pinscher is defined as a dog breed, a short-haired English Terrier, black and tan terrier, rough or wire-haired terrier. Some authorities state that the pinscher originated from stock brought back from England by German workers and that a cross with the French griffon-type produced the rough or wire-haired variety, to become known as the Schnauzer. Interestingly, there is an old English print from the early 1800s depicting a notable bull-and-terrier of that time, with a definite Continental look to it, called "Pinscher". In Ireland, the unusual smoke-grey coat of the Kerry Blue Terrier has been linked with the Harlequin Pinschers of the soldiers of the House of Hesse, who were stationed there. In Kay's Portraits From Nature (c.1810) there is an illustration from Scotland of a Pinscher; the coastal areas of the Scottish Highlands contained men who served as mercenaries in German armies. The Pinscher may have been imported by them. As far as the German Hunt Terrier is concerned, the reverse may have happened. When I was working in Germany nearly forty years ago, an old German Forstmeisster told me that his grandfather had imported English hunt terriers to control vermin. International boundaries have never been barriers to the dog trade. Terrier breeds which emerged in Britain in the 19th century, whatever their origin, are, with a few exceptions -- like the Border Terrier, markedly different in some respects nowadays from the stock shown at early dog shows. Some of these differences are displayed in even shorter legs, in breeds which already featured short legs, even longer muzzles (and narrower in Fox Terriers) and greater cloddiness, as in the show Sealyham. But even more noticeable, are the far heavier coats, in today's Scottish Terrier for example, and, sadly in so many terrier breeds, upright shoulders and no falling away at the croup. These two latter features are responsible for the greatly-abbreviated front and rear stride in these breeds, resulting in movement falsely described by some as a "terrier action". This lack of extension, fore and aft, can never be acceptable in a sporting terrier, especially an earth-dog. Kennel Club recognition has undoubtedly brought uniformity to these breeds and perhaps greater beauty. But beauty, in a terrier, at the expense of function, is an empty gain. Function dictates form in quadrupeds and form contributes both to health and quality of life. I shudder when I hear a TV commentator at Crufts excitedly describing sporting terrier breeds on the move as "simply flowing over the ground". Millipedes flow over the ground; dogs, whatever their size, should stride. Regrettably, exaggerations in dogs with a closed gene pool always end up exaggerating themselves. Outcrossing to restore true type may be regarded as sacrilege by conformists. But why, once attracted to a breed, not honour its true blueprint? Why betray its original type and true form? Sadly, most show breeders are extraordinarily conformist, even when true breed type in their favoured breed is threatened. Pedigree dog breeders and dog show judges often draw an undeserved awe from the general public; some are undeniably gifted, most are very obviously not. An experienced breeder, even to the KC, all too often means someone who has bred a lot of litters, whatever their quality. Judges, similarly, can progress if they have bred prolifically from their stock. This insanity not only leads to false reputations being gained but far too many puppies being bred. No livestock judge at an agricultural show is ever chosen on the basis of how many calves or lambs he or she has bred. Pony and houndshow judges are chosen for their knowledge not their production line. The same criterion, if applied in the world of pure-bred dogs, would represent a giant step forward. Far too many dog breeds have been at the mercy of wallet-conscious, power-seeking puppy-producers posing as experts in their field. Terriers designed originally to work should never feature over-heavy coats, a cloddy build with little flexibility, ant-eater heads or limited extension when moving. In his monumental Dogs of all Nations, published in 1904, H A graaf van Bylandt describes what we would today call a Schnauzer as a wire-haired German Terrier. The texture of coat is described as "straff" or stiff. When you look at Schnauzers of all sizes in contemporary show rings all over Europe they do not appear to feature coats with a stiff texture. Today's breed standard for the Scottish Terrier describes the coat as close-lying with a harsh outer coat. In his book on the breed, published seventy years ago, W L McCandlish set out the standard of that time. The coat was described as rather short (about 2"), intensely hard and wiry in texture; wave in the coat was described as a special fault. The Scottish Terriers that I see winning at shows have an abundance of coat -- well over four inches, with waviness, standing off from the body; so much for breed standards and a respect for a breed's heritage! The great Fox Terrier expert Rosslyn Bruce, in his book on the breed of 1950, writes: "The coat, or the outside covering or jacket, is that part of the Terrier which is perhaps the most difficult for the novice to grasp..." He might have included judges in that sentence. Rosslyn Bruce warned against a too long-headed dog with a too short back; I see many winning dogs today featuring these two components. He was very specific on the subject of shoulders, stressing their need to be long and sloping, well laid back. He pointed out that: "Where the shoulders are well laid back the dog is at an advantage for work underground." With most sporting terriers in today's show ring, I find upright shoulders and, increasingly, short upper arms. Unless knowledgeable judges penalise this bad fault it will become a breed feature and be bred in for all time. Should we not keep faith with those who developed these splendid breeds for us? The early terriers had the weatherproof coat, the extension in their limbs which allowed them to function and the never-say-die attitude which made them invaluable to man in farms and factories alike. I have vivid memories, as a boy, of the wire netting going round the ricks and the terriers being loosed, to kill over 200 rats per rick despite the odd bite. No machine could ever do that -- or chemical. Gassing or poisoning is a dreadful way to control rats; terriers are fast and efficient. Anyone with a bored teenaged son should give him a copy of Brian Plummer's classic "Tales of a Rat-Hunting Man", it's lively, amusing and uplifting -- just like terriers themselves!